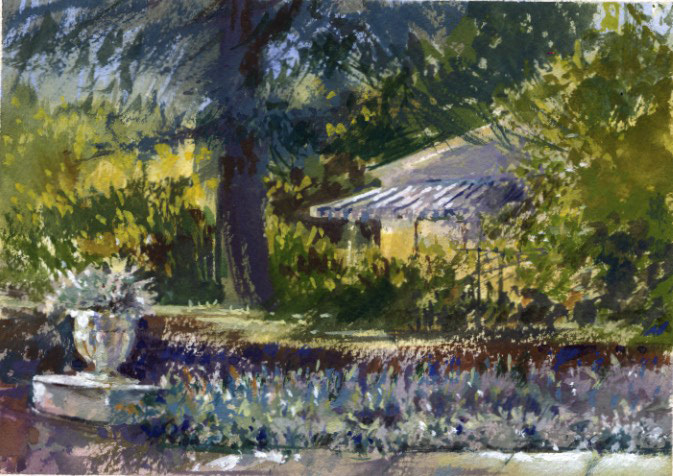 The Saturday paint-out group usually visits E. Waldo Ward Ranch in Sierra Madre before the holidays. There is a gift shop, handy for holiday gifts, which features all of the jams and marmalades that are produced at the Ranch. On my previous visit in July we painted in the late afternoon to take advantage of some different lighting from our usual morning paint-outs, Ranch Afternoon. I'm late in posting this gouache piece I painted in early December. Someone works hard on the plants and casual gardens here and there around the property. I always enjoy seeing what new garden areas have been developed. A garden urn surrounded by blue gray succulents caught my eye this time. 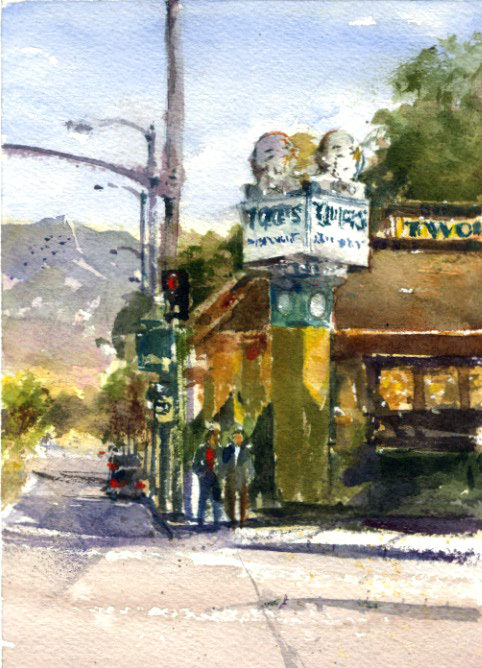 Twohey's, a landmark coffee shop in my neighborhood is closing January 31. It's been a local favorite for 75 years. "The Home of Little Stinko" opened in 1943 and featured car hop service. It was a very special place to go when I was a little kid. It's been remodeled several times over the years. No more car service of course. And now they will be reopening in another location...soon we hope. Besides the onion rings and hot fudge sundaes, the distinctive neon sign of Little Stinko (with a clothespin on his nose) has contributed to its popularity. 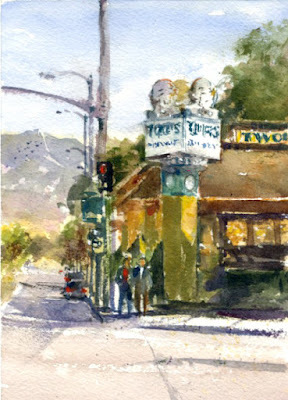 On our recent Saturday paint-out at Twohey's I wanted to include the sign. I sat by a traffic-signal box across the street where I had a nice view of Twohey's and the mountains. I'm surprised to note that this is my 500th blog post! My painting friend Pete Morris waiting to cross the street. I was excited to try painting at night again. My first attempt was almost two years ago, Night Scene! The paint-out group returned to the same street in Monrovia last night. It happens that I was just there a few Saturdays ago and painted a small watercolor of my view across the street, Last 2017 Paint-Out. My thought for the night painting was to paint it from the same spot as I had painted the morning piece a few weeks ago. It would be a fun contrast of the same scene at a different time of day. 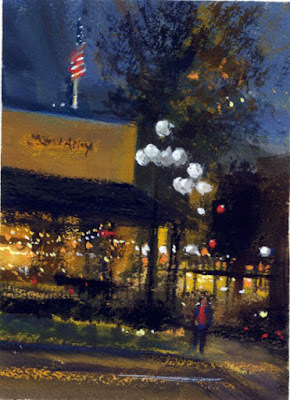 My daytime painting was a transparent watercolor but for the night scene I decided to use gouache, opaque watercolor. This main Monrovia street has bright, globe type lamp posts which make a nice point of interest for a night scene. The street was very busy with people going to the Friday night street fair and farmer's market. This piece turned out to be a challenge, as nighttime painting is, but I like how it turned out, and it was fun painting with friends as always. 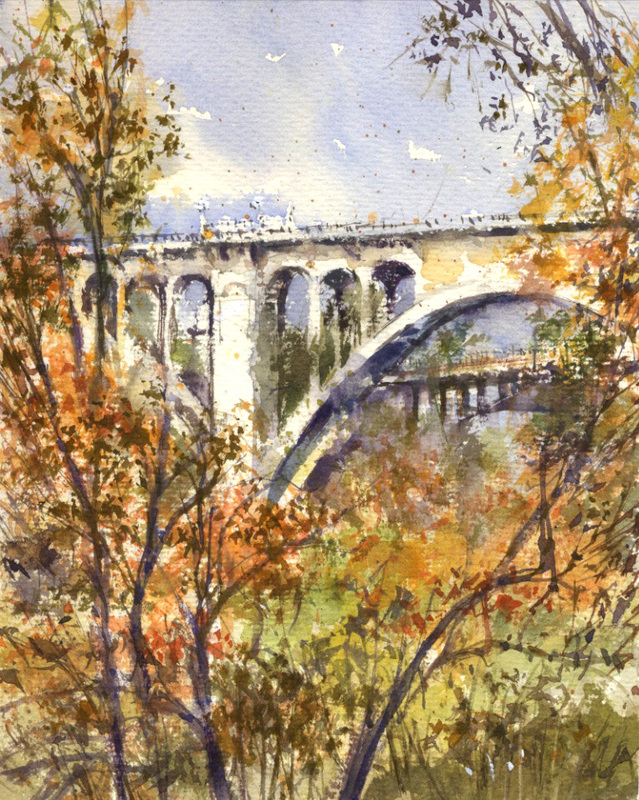 My first plein air painting for 2018 turned out to be of the famous Colorado Street Bridge in Pasadena. It's a Southern California landmark, constructed in 1913. It's also a favorite subject for painters. 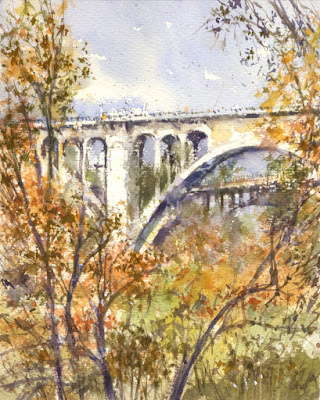 I've painted the bridge once before, over two years ago, The Bridge. Today the group met at La Casita Del Arroyo which is on a bluff on the east side of the Arroyo Seco. I've painted the arroyo stone Casita several times before. There are also nice views of the bridge so I decided to give it another try. I liked the fall colors of some of the arroyo trees. So many branches and leaves I could keep adding but time to stop I think.